What is Iranian Kabkab Date? Iranian Kabkab Date is a wet Date which has a semi-dried texture, also it is long and dark brown and after Astamaran Dates, Shahani Dates and Mazafati Dates, this Date has the most economic value in Iran. Kabkab Date can be considered as the most important and the most abundant Date fruit in world which can be grown in most tropical cities of Iran. All the dates are difference in terms of size, type, color, water, sugar levels, shapes and sizes which depend on the type of soil, water, air and moisture in their cultivation. The Date production of each region and the main figures of exports are important. Some of Date figures such as Shahani, Mazafati, and Kabkab are very good and are among the best quality Dates in the world. Kazerun city is one of most important and most extensive cities of Fars province (one of the 31 provinces of Iran) that is settled in the southwest of the Iran. So, its dry and hot weather has caused the city’s rich date palms. Kazerun city with a similar level of 4 thousand and 600 hectares is one of the major areas for palm production as annually about 30 thousand tons of dates. Dashtestan city is one of most important and most extensive cities of Fars province (one of the 31 provinces of Iran) that is settled in the southwest of the Iran. So, its dry and hot weather has caused the city’s rich date palms (date palm is the only exported agricultural product of this province). This city has the first place in production of date palm and citrus. Around 16,250 hectares of lands in the city are allocated to palm cultivation. Dashtestan city's economy depends on agricultural products, especially date palm. Kabkab Date is one of the most widely consumed and delicious wet dates in the world that can be grown in most tropical cities of Iran but the most kind of Iranian Kabkab Date fruit is cultivated in Khesht and Kamarj areas of Kazerun and Dashtestan cities (Borazjan). This Date also is grown in other cities with suitable condition such as Khormuj, Behbahan, Kazerun, Jahrom and Tabas. The cultivated Date palm in Behbahan has a sweet taste and is smaller compared to Dashtestan Kabkab Date. Kabkab Date is soft in nature and has high moisture. Its moisture is under %18. Kabkab Date in the Khark and Rutab stages (process) is yellow and when becomes ripe; its color turns into dark brown. Kabkab Date Shape is so long, oval, round, wet, soft with a very fine texture. The weight of each fruit is between 9 to 15 grams and the color of the fruit in final stage is brownish black. This date fruit has a hard skin and its flesh is roughly 9.25. The pit is an oval long grey in color which is highly cling to the flesh. Kabkab Date Size is about 3.5 to 4 cm. Each of these can be divided into two types of pitted and unpitted. Kabkab Date is very delicious sweet and full of syrup. Kabkab Date harvesting time is Mid-September. Our company is always offering high quality products and most favorable service for our buyers, we take quality as important as service. 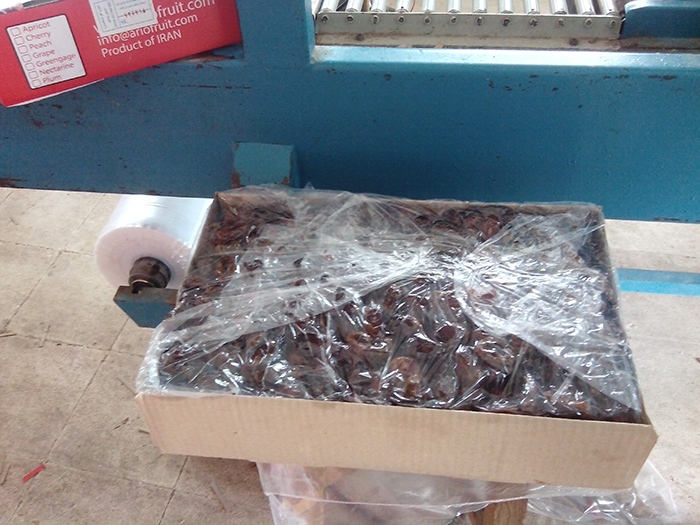 Packaging and exporting these Date Fruits for thirty years, the company have had impressive experience in this field. Kabkab Date is a wet Date fruit which can be kept in normal room temperature for about 6 months under interim fumigation (doesn’t require the fridge). Also, it could be kept in the dry and cold storage for long term. All dates due to their natural nutritious substances have high nutritious value. Kabkab date, Zahedi date, Piarom date, Rabbi date, and bam fresh Mazafati dates are all rich in nutrients and contain minerals (potassium, magnesium, protein, etc. ), Vitamins (like vitamin A, vitamin B complex, vitamin C, etc.) and sugars (like fructose, etc.). The date fruit consists of 70 % carbohydrates (mostly sugars), making it one of the most nourishing natural foods available to man. The water content is between 15 to 30% depending on the type and on the maturity stage of the fruit. In most varieties, the sugar content of a date fruit is almost entirely of the inverted form (namely glucose and fructose), important for people who cannot tolerate sucrose. The invert sugar in dates is immediately absorbed by the human body without being subject to digestion like ordinary sugar. The flesh of dates contains 60 to 65% sugar, about 2.5% fiber, 2% protein and less than 2% fat, minerals, and pectin substances. Date fruits are also a good source of iron, potassium and calcium, with a very low sodium and fat content. In addition, moderate quantities of chlorine, phosphorous, copper, magnesium, silicon and Sulphur are also found in the date fruit. Its high content of magnesium (±600 mg/1kg of dates) could also be very beneficial. With only 1 mg of sodium per 100 g, dates are good food for those on a low sodium diet. The iron content of 3 mg per 100g is almost a third Recommended Dietary Allowance for an adult male. Note that fiber, even though not a nutrient for humans is of much value in a diet as an aid to digestion and evacuation. There is ample evidence that for most people a diet fairly high in fiber is healthier than one low in fiber. Furthermore, dates are a good source of vitamins A, B1 (thiamine), B2 (riboflavin), and B7 (nicotinic acid also called niacin). The following contents per kilogram are an average for all date varieties: vitamin A, 484 international units; B1, 0.77 milligram (mg); B2, 0.84 mg; and B7, 18.9 mg. The seeds are also burned to make charcoal for silversmiths, and can be strung in necklaces. Date seeds are also used in the manner of coffee beans, or as an additive to coffee. Dates can be eaten plain or used for cooking in chopped form for cakes, sweet, pudding, bread, ice cream, cereal, candy. The remains of dates are used in jam, jelly, juice, syrup, vinegar and alcohol. 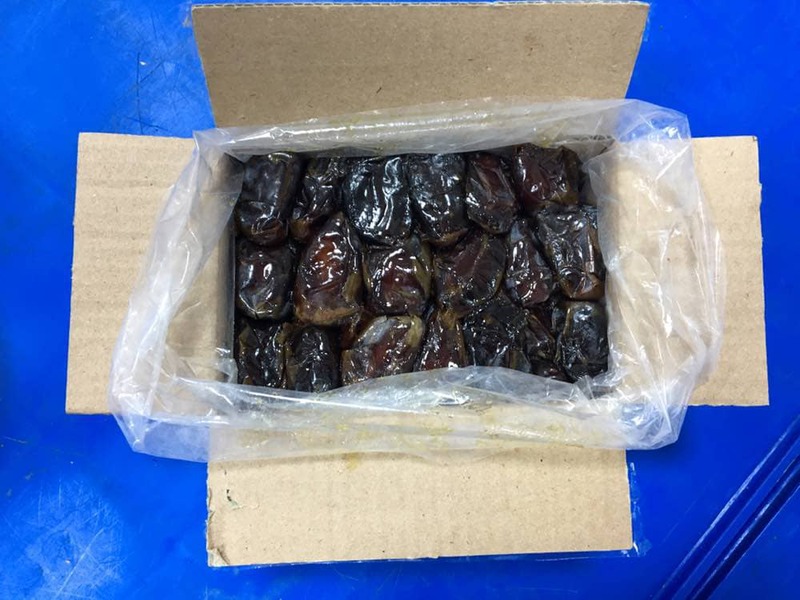 Dry or soft dates (Zahedi, Rabbi, Piarom, Mazafati, etc.) are eaten out-of-hand, or may be seeded and stuffed, or chopped and used in a great variety of ways: in cereal, pudding, bread, cakes, cookies, ice cream, or candy bars. The pitting may be done in factories either by crushing and sieving the fruits or, with more sophistication, by piercing the seed out, leaving the fruit whole. The calyces may be mechanically removed also. The remains are made into cubes, paste, spread, powder (date sugar), jam, jelly, juice, syrup, vinegar or alcohol. Also other products such as palm sugar, chocolate, Fruit Bar, raw material of some soft drinks can be produced, due to its high durability, the shipping of which is easy and requires no refrigeration. 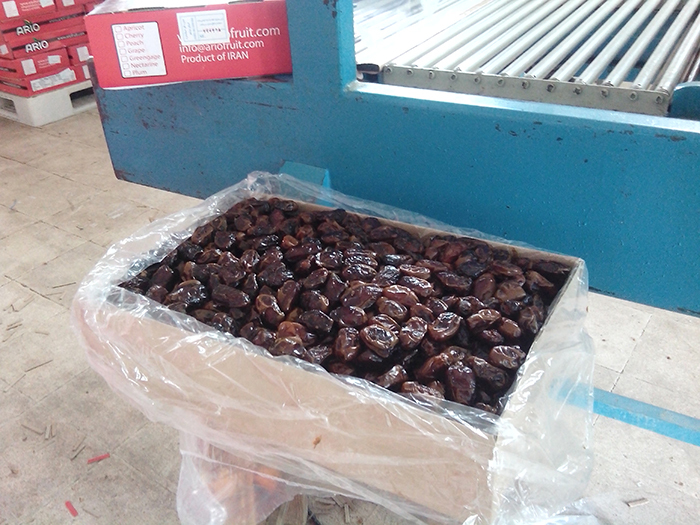 Kabkab is one major kind of dried Date with huge annual yield. This Date can be considered as the most frequently consumed kind of Date fruit in Iran and can be grown in most tropical cities of Iran. 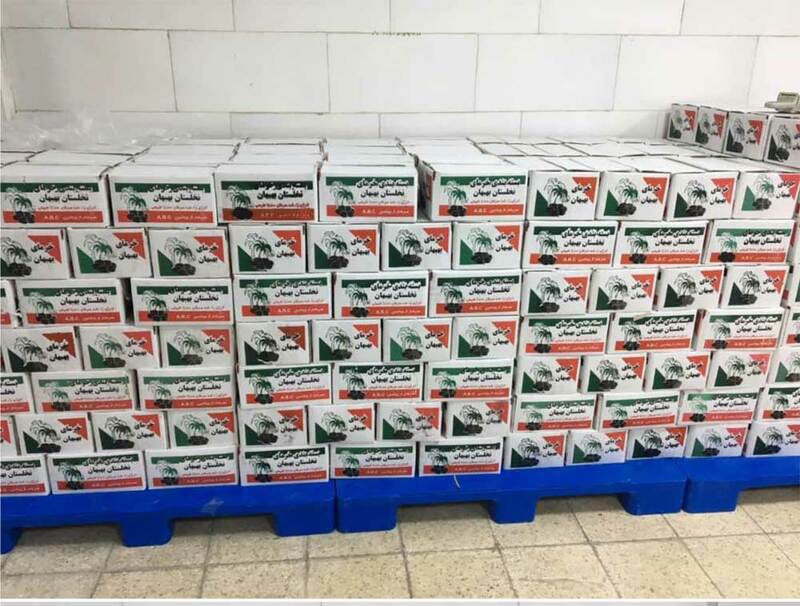 The largest portion of this product is consumed in domestic markets, but due to its production growth with high quality during the recent years steps have been taken for exporting this product. 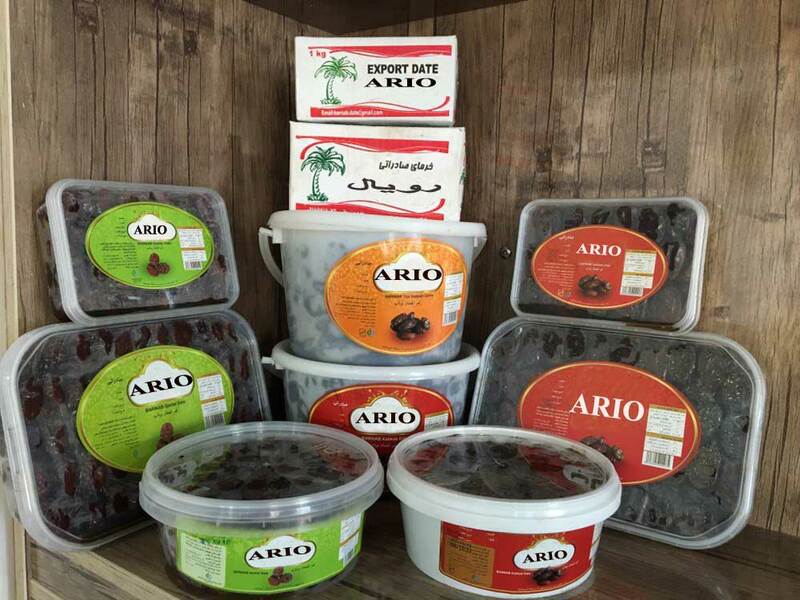 Ario Co is one of the most prominent and the largest supplier of the Date Fruit in Iran. 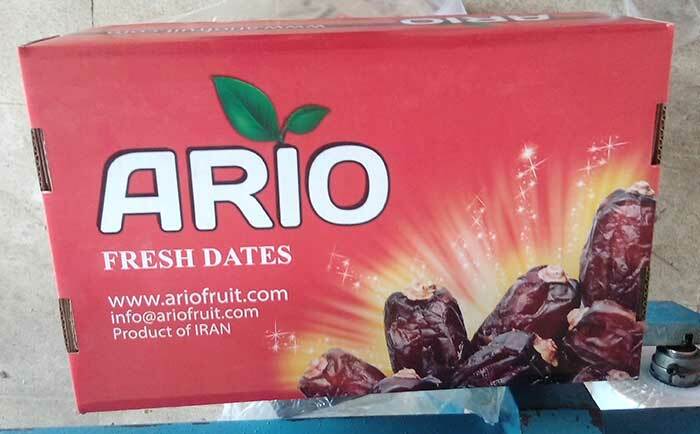 Ario Co was established in 1985 in order to provide and supply various fresh kinds of the date Fruit such as pitted, fresh and dried Dates in Iran and even other countries. 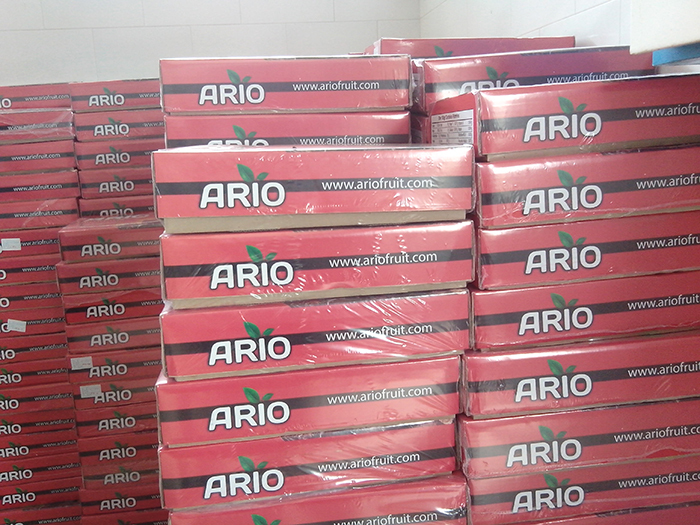 The main activities of the ARIO Company are growing, packaging and exporting Date Fruit.